Enjoy world-class sunrises and sunsets from your very own private island. 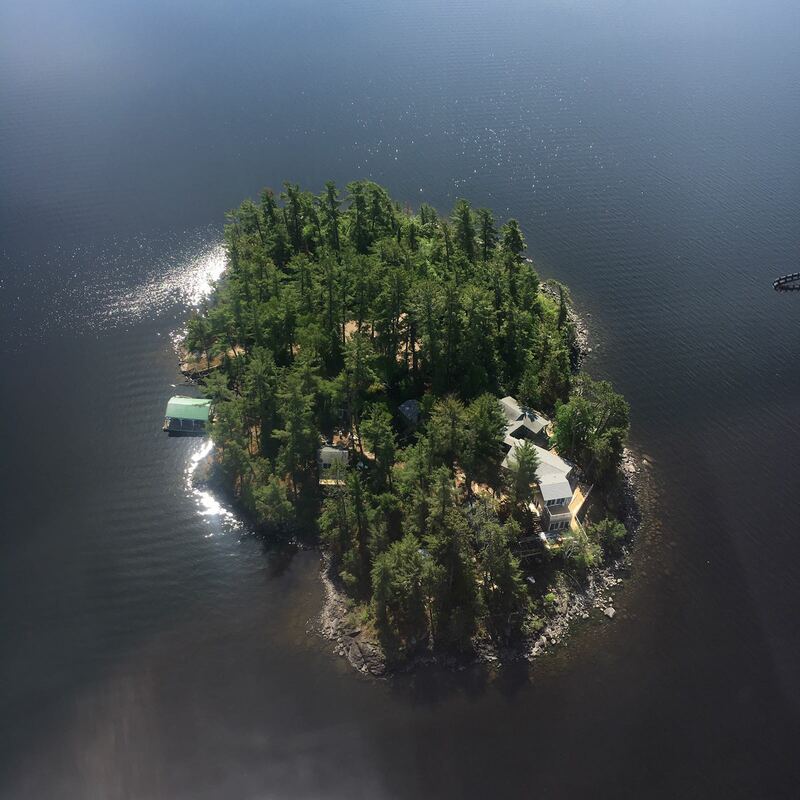 Located on Big Stone Bay on Lake of the Woods, Ontario (near the mainland), one of the best Walleye and Bass fishing areas North America. This stunningly beautiful island has 3 separate buildings in a private setting with the convenience of hydroelectricity, a full septic system and WiFi. The island is perfect for family holidays, with beds for a maximum of 16 people. The multiple docks supply ample space for swimming, kayaking, fishing, and boating with boat parking for 4-5 boats. There is also a hot tub, trails, and a badminton court. 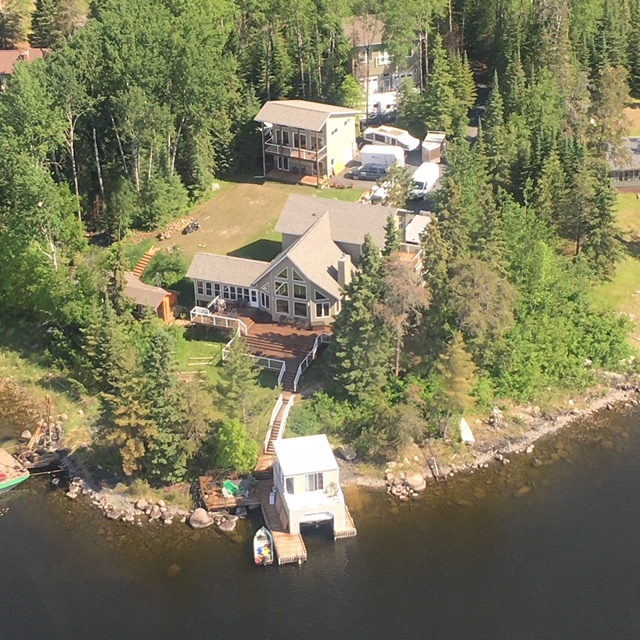 The entire complex was newly built / fully renovated in 2018 and features quartz countertops and island, modern appliances, WiFi, 2,000 square feet of wrap-around decking, 3,000 square feet of living space, including 8 bedrooms, 5 bathrooms, 3 showers, a wood stove, and a 14-person dining room with 270° of wrap-around windows overlooking the lake to the sunset. These sunsets are to die for, as they have 6-12 km of open water in front of the island, depending on the season. Other important amenities include forced air heating and A/C, a washer & dryer, and satellite TV. A handmade walnut bar is also available for entertaining purposes, only 6 meters from the hot tub. This is paradise found. Ultimate luxury in a rustic, natural, secluded setting. The island overlooks a large bay with world class sunsets. Located on just off the shores of Stormbay Rd, Branch Rd 7 on Bigstone Bay, this magnificent property features a total of 3000 square feet of living space. With three separate buildings and a total of 8 bedrooms (all-new luxury mattresses, 2 kings, 4 queens, 1 double and a twin bunk bed), 5 toilets, 3 showers and a beautiful spacious island kitchen and living space. The existing buildings were fully renovated and 800 square feet have been newly built. The 3,000 square feet of living space feature vinyl luxury plank flooring. We have also installed a new highest-standard, environmentally-friendly septic system. The 2,000 square foot, multi-level deck leads down to the water and to the south-facing swim dock. The east side of the property is perfectly situated to watch morning sunrises. The covered boat dock (one covered spot and two uncovered spots) faces northeast to keep the boats safe from storms. Meanwhile, the hot tub, bar, and surrounding deck area has amazing sunset views. This property offers so much for your family to enjoy and is only a 2-minute boat ride from our mainland property that can be used for car parking. A pontoon boat is also available upon special request. Access: Island accessed via 2-minute boat ride over water. Beds:In total there are 2 king beds, 4 queen beds, 1 double and 2 twins in the bunk bed. Find out More on AirBNB!